Louisville, KY (September 8, 2014) – Kentucky Farm Bureau’s (KFB) Emmy® Award-winning television program, Bluegrass & Backroads, returns for its 11th season on the air, and fourth year in the broadcast lineup of Kentucky Educational Television (KET), this month. 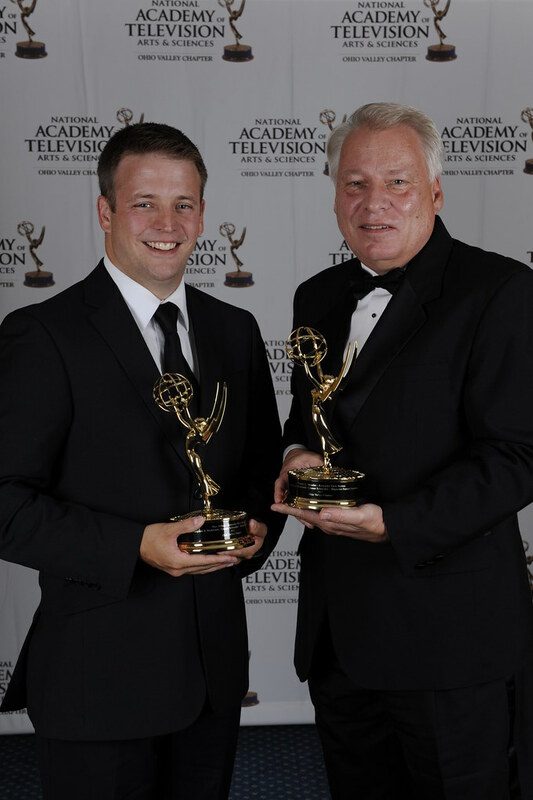 Matt Hilton (left) and Bob Shrader (right), producers and hosts of Kentucky Farm Bureau’s “Bluegrass & Backroads,” received an Emmy® Award for Best Magazine Feature/Segment during the 2012 Annual Ohio Valley Regional Emmy® Awards. Bluegrass & Backroads is a 30-minute show that explores the various agricultural, cultural, historical and artistic stories unique to Kentucky. Produced at the KFB state headquarters in Louisville, the program is written, filmed, hosted, directed and edited by the two-person team of Shrader and Matt Hilton. This promotional video offers Shrader’s and Hilton’s preview of the Bluegrass & Backroads Season 11 and provides viewers with a behind-the-scenes look at the thought process for creating episodes. Season 11 episodes of Bluegrass & Backroads will air on KET at 12:00 a.m. on Wednesdays, on KET2 at 4:30 p.m. on Saturdays, and on KETKY at 7:30 a.m. and 11 p.m. on Sundays, 12:30 p.m. on Tuesdays, 8:30 p.m. on Thursdays, and 7:30 a.m. on Fridays. Season 11 will also be shown on RFD-TV at 5:30 p.m. on Wednesdays and 4:30 a.m. on Sundays. All times are Eastern Time Zone. To learn more about Bluegrass & Backroads or watch episodes online, visit: bluegrassandbackroads.com. “Like” and “Follow” Bluegrass & Backroads at: facebook.com/bluegrassandbackroads and twitter.com/backroadstv.